The two competing national suffrage organizations—the National Woman Suffrage Association and American Woman Suffrage Association—joined in 1890 to become the National American Woman Suffrage Associatin. Alice Stone Blackwell, the daughter of the American association leader Lucy Stone, spearheaded successful negotiations to merge the two groups. Three women stand in front of a horse-drawn wagon with a sigh supporting the NAWSA, Library of Congress. The two competing national suffrage organizations—the National Woman Suffrage Association and American Woman Suffrage Association—lasted over two decades. Suffragists worked to mend the split from the start, but were unsuccessful. Alice Stone Blackwell, the daughter of the American association leader Lucy Stone, spearheaded successful negotiations to merge the two groups in 1890. For the first time, suffragists united behind a single national organization: the National American Woman Suffrage Association (NAWSA). Elizabeth Cady Stanton became the president of the new group, though she did not like the administrative duties of the office. Susan B. Anthony largely led NAWSA during Stanton’s presidency (1890-1892) and her own (1892-1900). Anthony groomed protégées before she resigned, including Carrie Chapman Catt and Anna Howard Shaw. Catt held office from 1900 to 1904, and Shaw led NAWSA from 1904 to 1915. Catt regained the office of president in 1915 and held it through the passage of the Nineteenth Amendment. NAWSA coordinated the national suffrage movement. The group was made up of local and state groups throughout the United States. Member dues funded annual conventions where suffragists met to discuss campaigns. Women like Rachel Foster Avery circulated newsletters with the latest suffrage updates. NAWSA had local and national press committees that wrote pro-suffrage articles published in newspapers around the country. Not everyone was able to participate in NAWSA. Although NAWSA did not exclude African American women from membership at the national level, state and local organizations could and did choose to exclude them. Conventions held in Southern cities like Atlanta (in 1895) and New Orleans (in 1903) were segregated. NAWSA also required black women to march separately during its 1913 parade in Washington, DC. Even within this socially progressive movement, racism persisted. What were its goals and strategies? How did they a continuation or departure from prior strategies? How did NAWSA compare to earlier organizations? 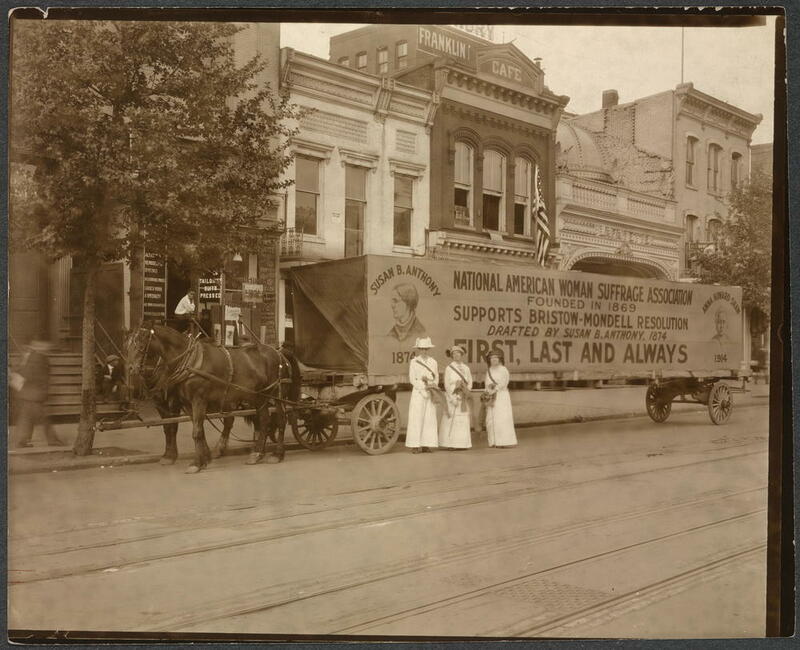 Photograph of three women standing in street in front of horse-drawn wagon with sign, "National American Woman Suffrage Association founded in 1869 supports Bristow-Mondell Resolution drafted by Susan B. Anthony, 1874, First, Last and Always." Elizabeth Cady Stanton, "Solitude of the Self"
Elizabeth Cady Stanton was a true leader of the woman suffrage movement, serving as the president of the National Woman Suffrage Association for twenty years and the as first president of the National American Woman Suffrage Association. At the age of 77, in 1892, Stanton stepped down as president. “Solitude of the Self” was her resignation speech, and in it Stanton argues for women’s equality. Stanton saw women as citizens of the country and argued that they should therefore be treated like all other citizens. This meant women should have access to all things men did, such as the right to vote, higher education, and “freedom of thought and action.” Through her words it is clear that Stanton sees all individuals as walking alone in life and they therefore need all of their rights to prosper. Women marchers organized by country, state, occupation, and organization, led by Miss Inez Milholland and Mrs. Richard Coke Burleson, during the suffrage march, March 3, 1913, Washington, D.C.
Photo shows lawyer Inez Milholland Boissevain riding astride in the suffrage parade as the first of four mounted heralds. In her short life she shared with many of her fellow marchers a commitment to social reform. She joined organizations striving to improve the working conditions of children and the lives of African Americans. She was also a strong supporter of the shirtwaist and laundry workers. Three years after the parade, she collapsed and died at age thirty during a western suffrage lecture tour. Photo shows Grand Marshal Mrs. Richard Coke Burleson (center, on horseback) leading suffrage march on March 3, 1913. Official program - Woman suffrage procession, Washington, D.C. March 3, 1913 / Dale. Cover of program for the National American Women's Suffrage Association procession, showing woman, in elaborate attire, with cape, blowing long horn, from which is draped a "votes for women" banner, on decorated horse, with U.S. Capitol in background. Photo shows suffragist Florence Jaffray "Daisy" Harriman (1870-1967) holding a banner with the words "Failure Is Impossible. Susan B. Anthony. Votes for Women." Photo taken at the Woman Suffrage Parade held in Washington, D.C.